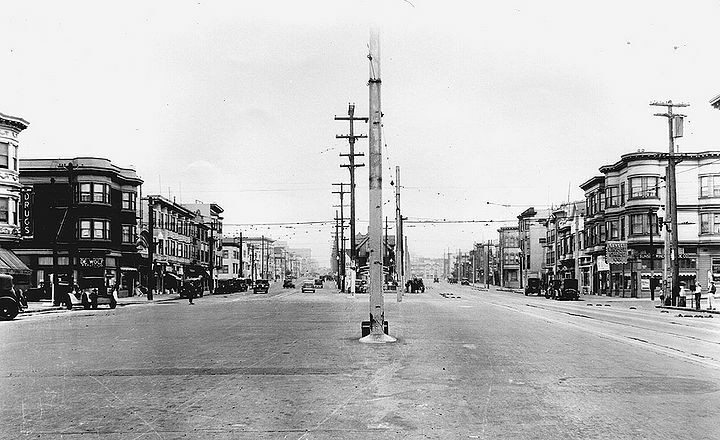 California (left) and Cornwall looking east at 6th Avenue, 1932. The area has been referred to for many years as the "Outside Lands" or, on one map, as "The Great Sand Waste." Needless to say this was not pleasing to its local boosters. In 1889, about the time the improvement club was trying to decide on a more dignified name for the district, one of its members, George Turner Marsh, was building a beautiful home on the southeast corner of 12th Avenue and Clement... He planned to call it Richmond House in memory of his native home in Richmond, Australia, a suburb of Melbourne in the state of Victoria. When various names for the new district came up for discussion, one of Marsh's friend, George R. Fletcher, asked, "What is the matter with calling it 'Richmond," and, there being nothing the matter, the suggestion was motioned and seconded. Marsh's birthplace of Richmond, Australia got its name when his ancestors emigrated there from the town of Richmond, England, and named their new homeland after the old. Richmond, England originally was named after a lovely castle, called Richmond, located on the nearby river Thames. The castle had been built by England's first Tudor king, Henry VII. It could be said, therefore, that San Francisco's Richmond District was named, indirectly, after a castle in England. The only flaw in this romantic derivation of our District's name is the little-known fact that this area has not been--officially-- the Richmond District since 1917. A subsequent ordinance of the S.F. Board of Supervisors changed the District's name to the Park Presidio District.